From January 31-May 31, 2011, 70% of the proceeds of the sale of this pattern will be donated to Autism Speaks, as part of my fundraising for the upcoming Bay Area Walk Now for Autism Speaks. 2/2/11- Just sent off my first $100 donation from proceeds. Thank you all so much! 2/8/11- $160 total so far! Thank you!! I’ve worked with children with autism for the past 20 years, and each child I work with is a unique individual. These socks attempt to capture that. The pattern features four different design options for the top of the foot, allowing you to create your own individualized socks. 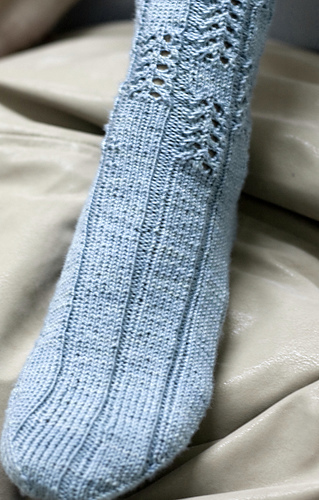 Instructions are written for a cuff-down sock. Both written and charted instructions are provided.